After 8 years of designing and printing letterpress posters at the legendary Hatch Show Print in Nashville, Tennessee, Brad Vetter is moving on to new adventures in the great Midwest. 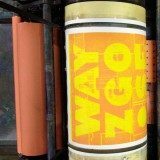 After designing countless posters for bands like Arcade Fire and Wilco, Brad is not showing any signs of slowing down, he continues to push the limits of letterpress printing through innovative techniques and always looking forward. He began his love for teaching as the Intern Supervisor at Hatch, and continues to share his knowledge of letterpress through hosting workshops and talking to anyone who will listen.